Additionally, the event includes conversations with scholars, writers and researchers who specialize in the relationships between death, memorialization and music in American history. Emory University professor Gary Laderman; American Afterlife author Kate Sweeney; and Oakland Cemetery tour guide Pat Powers will give “Graveside Chats” throughout the day. From 2 p.m. to 7 p.m., attendees are invited to explore and interact with The Cryptophonic Tour installations at their own leisure. Beer, wine and soft drinks will be available for purchase, as well as food from The Mobile Marlay, Tex’s Tacos, Nana G’s Chik-n-Waffles and King of Pops. A digital version of The Cryptophonic Tour’s map, program and performance schedule is now available for viewing online. 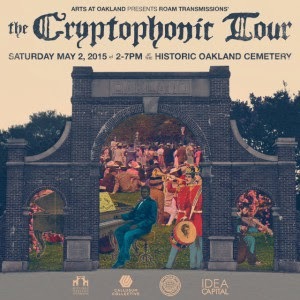 Tickets for The Cryptophonic Tour are $10 in advance and $15 at the gate (adults), $5 (children 3-12); free for children under 3. Advance ticketing is available online only, atticketalternative.com. It is a rain-or-shine event, and proceeds benefit Historic Oakland Foundation and ROAMtransmissions’ participating artists. For additional details, visitwww.oaklandcemetery.com or ROAMtransmissions. About Historic Oakland Foundation: Founded in 1850, Atlanta’s Oakland Cemetery spans 48 acres of gardens, wildlife and sculpture. Oakland is the ﬁnal resting place of 70,000 people, including author Margaret Mitchell, 27 Atlanta mayors, six governors, Civil War soldiers and thousands of unmarked graves. Oakland Cemetery offers critical green space for recreation and serves as a cultural resource for lifelong learners who come to study history, art, architecture, archaeology, horticulture, photography and more. Visitwww.oaklandcemetery.com for more details. About ROAMtransmissions: ROAMtransmissions is a collaborative sound art project that features the work of sonic scientists and aural explorers from across the globe. Using experimental recording techniques ROAMtransmissions harnesses the power of sound to stimulate the imagination. ROAMtransmissions is for your ears to see. Learn more atroamtransmissions.tumblr.com.